(Nanowerk News) An emerging super-black nanotechnology that is to be tested for the first time this fall on the International Space Station will be applied to a complex, 3-D component critical for suppressing stray light in a new, smaller, less-expensive solar coronagraph designed to ultimately fly on the orbiting outpost or as a hosted payload on a commercial satellite. 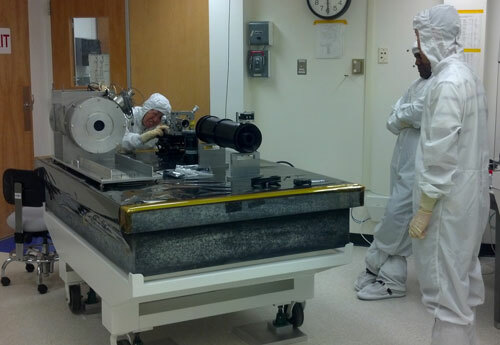 While the coating undergoes testing to determine its robustness in space, a team at NASA's Goddard Space Flight Center in Greenbelt, Maryland, will apply the carbon-nanotube coating to a complex, cylindrically shaped baffle — a component that helps reduce stray light in telescopes. Preventing errant light is an especially tricky challenge for Gopalswamy's team. "We have to have the right optical system and the best baffles going," said Doug Rabin, a Goddard heliophysicist who studies diffraction and stray light in coronagraphs. The new compact coronagraph — designed to reduce the mass, volume, and cost of traditional coronagraphs by about 50 percent — will use a single set of lenses, rather than a conventional three-stage system, to image the solar corona, and more particularly, coronal mass ejections (CMEs). These powerful bursts of solar material erupt and hurdle across the solar system, sometimes colliding with Earth's protective magnetosphere and posing significant hazards to spacecraft and astronauts. "Compact coronagraphs make greater demands on controlling stray light and diffraction," Rabin explained, adding that the corona is a million times fainter than the sun's photosphere. 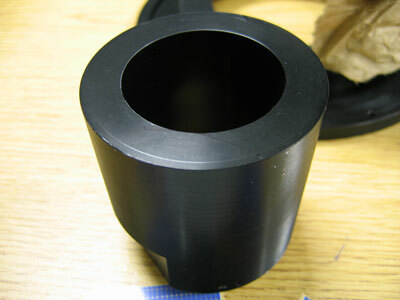 Coating the baffle or occulter with the carbon-nanotube material should improve the component's overall performance by preventing stray light from reaching the focal plane and contaminating measurements. "SOHO, which we launched in 1995, is one of our Great Observatories," Rabin said. "But it won't last forever." Although somewhat newer, STEREO has operated in space since 2006. "If one of these systems fails, it will affect a lot of people inside and outside NASA, who study the sun and forecast space weather. Right now, we have no scheduled mission that will carry a solar coronagraph. We would like to get a compact coronagraph up there as soon as possible," Rabin added. Ground-based laboratory testing indicates it could be a good fit. Testing has proven that the coating absorbs 99.5 percent of the light in the ultraviolet and visible and 99.8 percent in the longer infrared bands due to the fact that the carbon atoms occupying the tiny nested tubes absorb the light and prevent it from reflecting off surfaces, said Goddard optics engineer John Hagopian, who is leading the technology's advancement. Because only a tiny fraction of light reflects off the coating, the human eye and sensitive detectors see the material as black — in this case, extremely black. "We've made great progress on the coating," Hagopian said. "The fact the coatings have survived the trip to the space station already has raised the maturity of the technology to a level that qualifies them for flight use. In many ways the external exposure of the samples on the space station subjects them to a much harsher environment than components will ever see inside of an instrument." Given the need for a compact solar coronagraph, Hagopian said he's especially excited about working with the instrument team. "This is an important instrument-development effort, and, of course, one that could showcase the effectiveness of our technology on 3-D parts," he said, adding that the lion's share of his work so far has concentrated on 2-D applications. By teaming with Goddard technologist Vivek Dwivedi, Hagopian believes the baffle project now is within reach. Dwivedi is advancing a technique called atomic layer deposition (ALD) that lays down a catalyst layer necessary for carbon-nanotube growth on complex, 3-D parts. "Previous ALD chambers could only hold objects a few millimeters high, while the chamber Vivek has developed for us can accommodate objects 20 times bigger; a necessary step for baffles of this type," Hagopian said. "We have extreme stray light requirements. Let's see how this turns out," Rabin said.